For Family Home Evening this last Monday, my ward went to Balboa Park. During the summer, Balboa Park has free events that are just fantastic. And this one was great. (Grandma K you'll love this!) 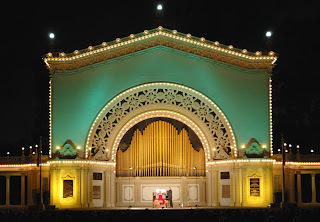 Balboa Park is home to the Spreckles Organ, the largest outdoor pipe organ in the world, they claim. During the summer on Monday nights, they have free concerts. This last Monday, the ward decided to add a little American culture to our lives. We attended this free event. 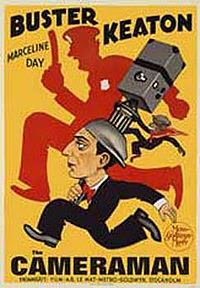 It was a Silent film titled "The Cameraman" starring Buster Keaton. I had never seen and silent film before. I LOVED it! It had all the classic comedy tricks, slipping on bananas, bathing suit coming off in pool of people, trying to get off the top of a double decker bus, and all the while, he was trying to become a cameraman and impress the cute stenographer at the news office. It was really cool. But the fun part about the event was that the music to silent film was being played live, right there on the organ. The gentleman playing was fantastic. The organ sounded great. I don't know how someone times the music to go along with the movie without modern editing equipment, but he did it and the whole thing was so fun. I'd do it again!